A 25-year-old man who admitted separating the Class B stimulant methylethcathinone (MEC) into bags on top of a cannon on the Derry Walls will be sentenced at Derry Magistrate’s Court in December. Gareth McGeady, of Aberfoyle Crescent, appeared at Bishop Street yesterday charged with the supply of the controlled drug on May 16, 2014. 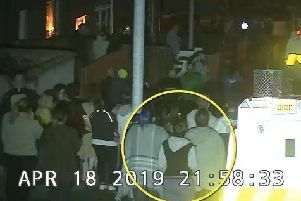 A Public Prosecution Service (PPS) solicitor told the court how on that date at around 11.30pm Derry’s city centre CCTV monitoring operators picked up two individuals separating powder on top of a cannon on the Walls before pouring it into ziplock bags. Police attended the scene but upon searching the defendant found that there were no drugs on his person. A number of zip lock bags containing the MEC were shortly afterwards recovered by police on the carriage of one of the cannons on the Walls, the PPS solicitor said. Mr McGeady later made admissions to the police and said that he had been asked by a friend to help him separate the drugs. Defence solicitor Paddy McDermott said Mr McGeady had been very frank with police, that he had been very much the lesser party, and that he hadn’t stood to gain anything out of the exchange financially. A pre-sentence report was ordered for December 16.